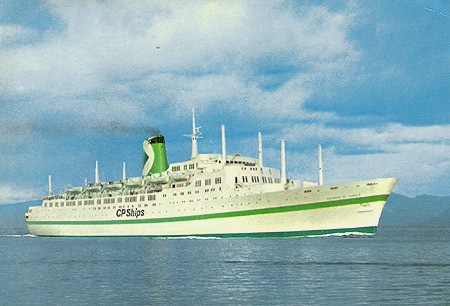 The EMPRESS OF CANADA of 1961 was the last passenger ship to be built for Canadian Pacific's Liverpool to Montreal service. The keel of the third new post-war Canadian Pacific 'Empress' was laid in January 1959 at Vickers-Armstrongs' yard at Walker-on-Tyne. Seventeen months later the new ship was maunched by Mrs Diefenbaker, the wife of the Canadian Prime Minister, on 10th May 1960, and named EMPRESS OF CANADA. In February 1961 the vessel was moved into the dry dock at Swan Hunter & Wigham Richardson's yard at Wallsend, and a month later, on 7th March 1961, she left for her trials in the Firth of Clyde. The EMPRESS OF CANADA carried out her speed trials over the Arran Mile on Saturday 10th March 1961 and achieved 23 knots, which was two knots above her designed service speed. After her trials were successfully completed, the new Empress returned to the Tyne for final adjustments by her builders, and arrived at Liverpool for the first time on 27th March 1961. She remained there for a month and was open for inspection by the shipping press and the travel trade. The new EMPRESS OF CANADA was enthusiastically received with one correspondent writing: "The new vessel matches in speed, grace and luxurious passenger accommodation everything that is best in British shipbuilding." 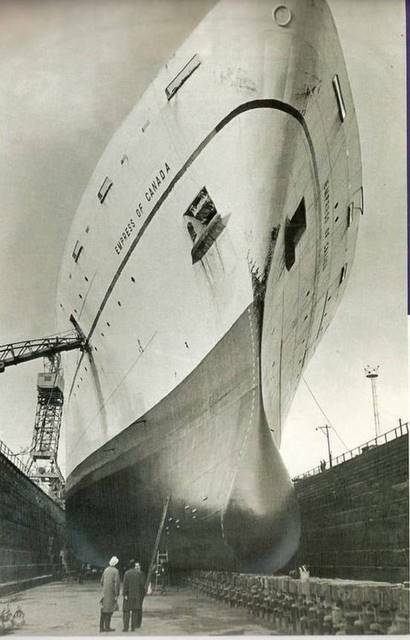 Canadian Pacific liner to have a bulbous bow. The ship was the first Canadian Pacific liner to be equipped with a bulbous bow, which, it was said would help in reducing pitching. She had Denny-Brown stabilisers and full air-conditioning. In first class there was accommodation for 192 passengers, and 856 could be carried in tourist class. 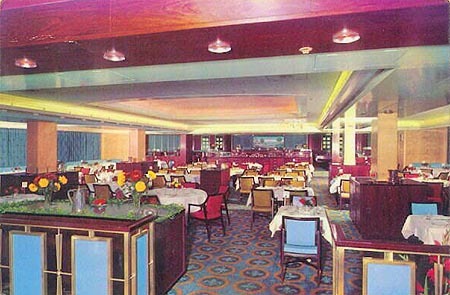 Another correspondent wrote: "The EMPRESS OF CANADA is undoubtedly the ship whose general decor, furnishings and accommodation are something we have been waiting for in a big liner for some time." 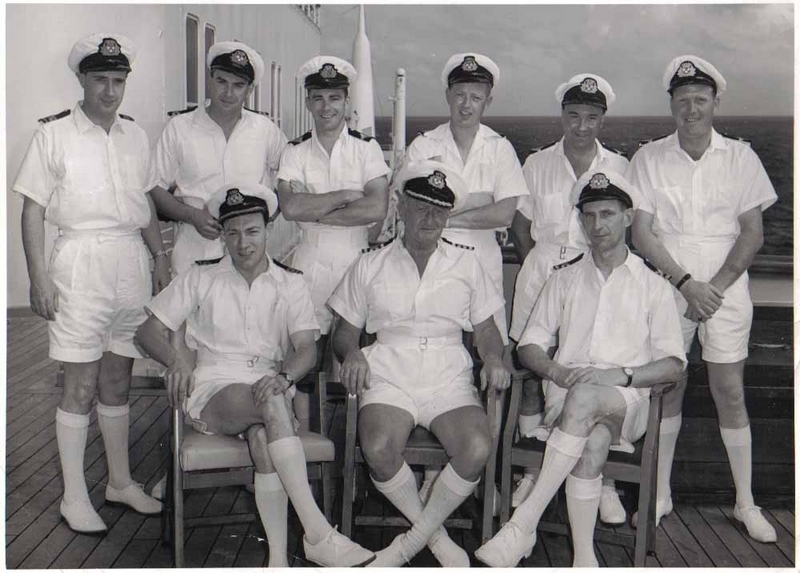 Over 70 per cent of the tourist cabins had private toilets, a vast improvement over other ships on the Canadian service. There were 262,000 cubic feet of cargo space and a crew of 510 was required to man the ship when she was fully booked. of 1947 is in the foreground. 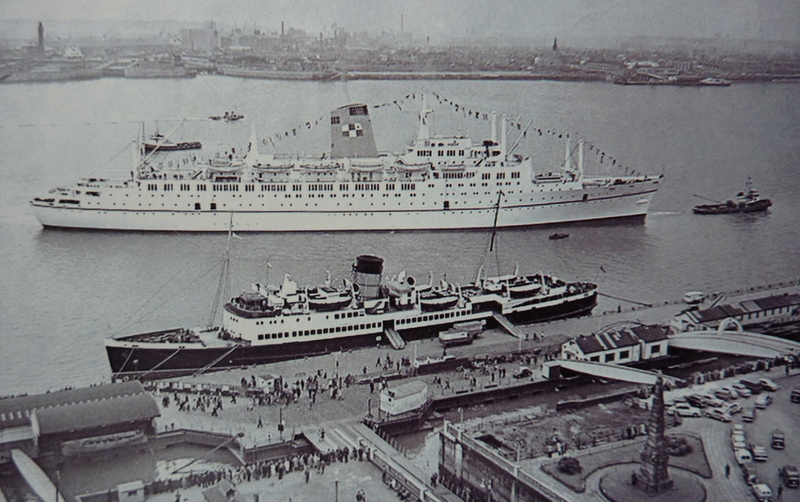 The EMPRESS OF CANADA left Liverpool on her maiden voyage on 24th April, 1961. The boat train from London, pulled appropriately by the engine named 'Empress of Canada', arrived at Liverpool's Riverside Station with over 400 passengers, including the author Nicholas Monsarrat ('The Cruel Sea'). Promptly at 6.47pm, the moment for which the thousands of spectators on the landing stage and the waterfront, the millions watching on television, and the 800 passengers on board, had been waiting for finally came. Slowly at first, as though shy to leave, but growing bolder with a churn of white water at her stern, the new Empress moved gracefully down the Mersey as the tugs drew back. She was saluted by an armada of tugs, dredgers, liners, freighters and ferry boats as she slid down the river into the mist after the most impressive send-off Liverpool had seen for many years. The new ship immediately ran into severe gales. She proved herself to be a fine seaboat and arrived at Quebec on 1st May. With a fleet of three modern passenger liners, Canadian Pacific was in an ideal position to offer extensive winter cruises. As flagship, the EMPRESS OF CANADA operated the prestige cruises out of New York. She left Liverpool on 12th December 1961 and made her maiden arrival at New York a week later on 19th December. There was no elaborate welcome for her as the city was shrouded in dense freezing fog. John Wayling, and on the front row (right) is Mike Scott. Many thanks to Mike Howden for putting the names to the faces. In 1962 the three Canadian Pacific Empresses made a total of thirty-three round voyages between Liverpool and Montreal. 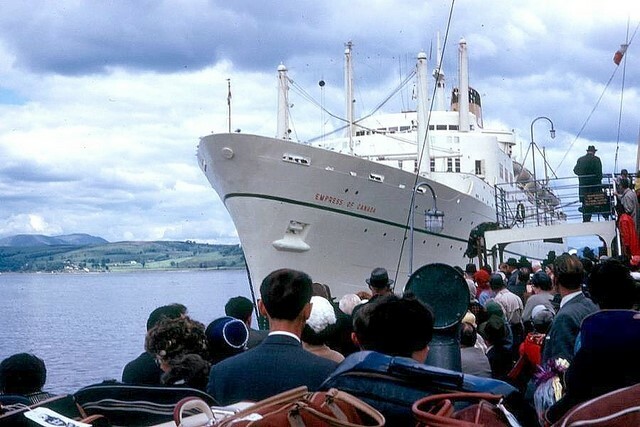 The EMPRESS OF CANADA was more extensively employed in cruising in the winter and spring of 1963 and in addition to her Caribbean cruises from New York, she sailed on a sixty-one day, thirty port Mediterranean cruise on 9th February. After performing flawlessly for over two years, the EMPRESS OF CANADA suffered some engine trouble in September 1963. She encountered the tail end of a hurricane on passage from Liverpool which was responsible for the damage. 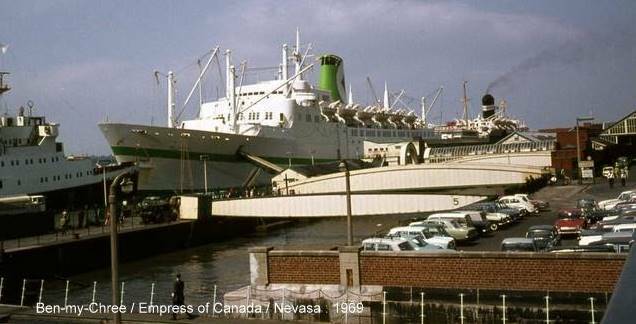 The EMPRESS OF CANADA docked at Quebec City on 18th September 1963 where all her passengers disembarked. She then proceeded to Montreal 'light ship' where repairs were effected. The resulting delays caused the Empress to be thirty hours late in arriving back at Liverpool. Her next voyage was hit by a strike of longshoremen in Canada and after arriving off Quebec on 8th October, she was not permitted to berth. After two days at anchor she sailed for Halifax, Nova Scotia, to discharge her passengers and cargo. New York whilst undertaking her winter cruise programme. 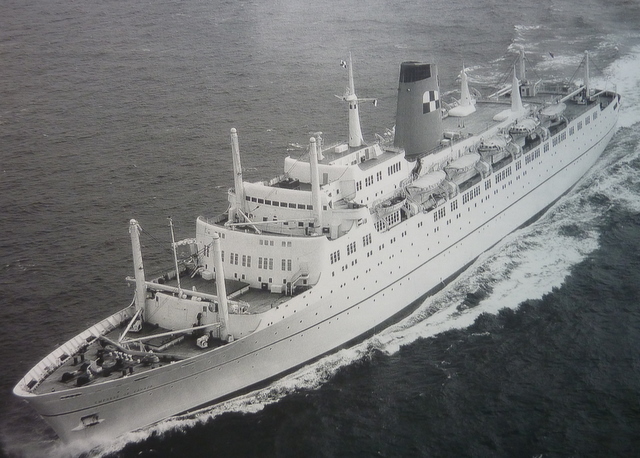 The 1966 strike of the National Union of Seamen affected the EMRESS OF CANADA when she arrived back at Liverpool on 20th May, and she was strikebound until the end of the dispute on 1st July, sailing for Montreal on 4th July. The EMPRESS OF CANADA was involved in a couple of mishaps in 1967. On the 8th February she ran aground at San Juan, Puerto Rico, but fortunately suffered no damage, and on 4th May she struck a whale which became impaled on her bow. Her captain ordered 'full astern' in the engines and the whale was dislodged. At the end of 1968 the EMPRESS OF CANADA suffered the indignity of being painted in Canadian Pacific's new corporate logo. Liverpool with the Clarence Dock powert station chimneys behind. 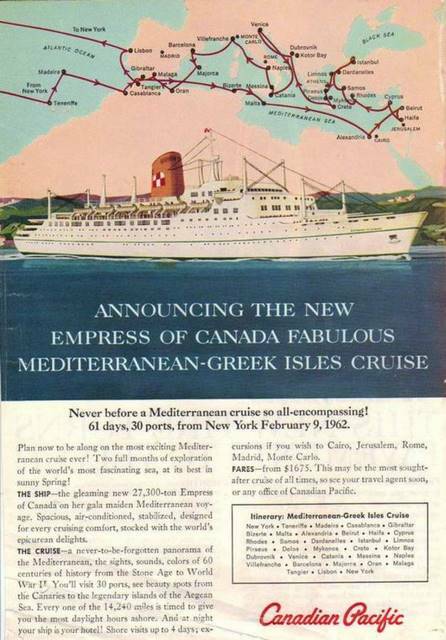 Faced with dwindling passenger numbers on the North Atlantic, Canadian Pacific extended the EMPRESS OF CANADA's New York-based Caribbean cruising programme into the summer of 1969, when she operated a total of thirteen cruises. The Empress was back in Liverpool on 10th June and sailed on one round voyage to Montreal. Following that she undertook a cruise to Norway and the North Cape, and this was followed by four more trans-Atlantic round voyages on the Canadian route. 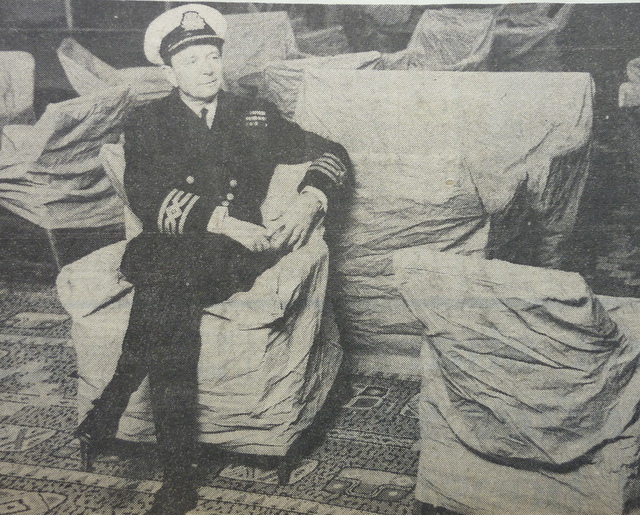 Following the announcement of the disposal of the EMPRESS OF ENGLAND in early 1970, the chairman of Canadian Pacific Steamships, Mr W.J. Stenason, said that his company would continue to operate the EMPRESS OF CANADA on Caribbean cruises and on the North Atlantic, and was confident that there was a viable economic future for the liner. 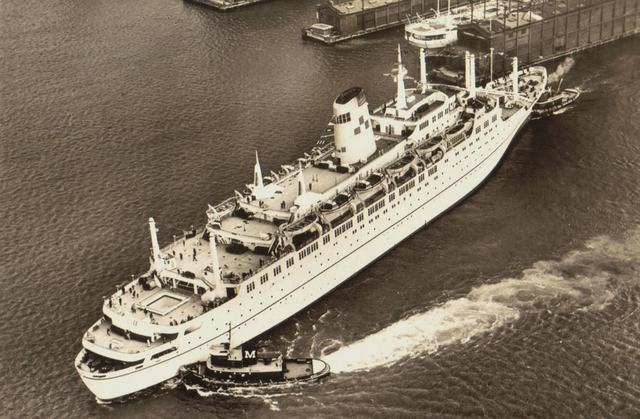 The EMPRESS OF CANADA had a shorter than usual New York cruising season in 1970 and on 6th April sailed direct to Montreal from New York to pick up her trans-Atlantic schedule. 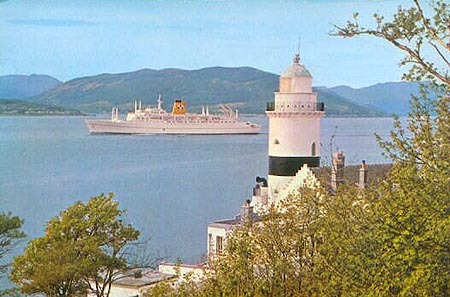 Calls at Quebec and Greenock were both dropped in 1970. The Empress made eleven round voyages on the Canadian service between April and October, and on 20th August carried a record 1,039 passengers on the westbound passage. 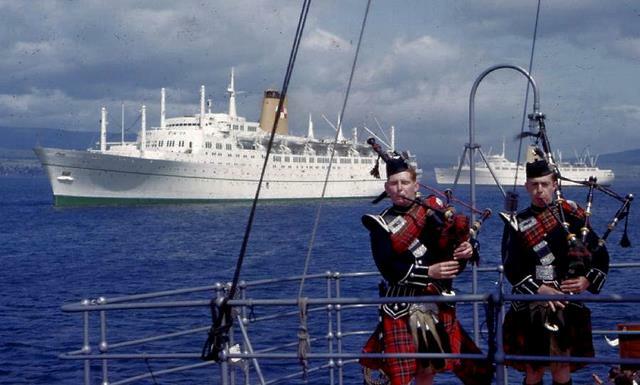 There was more categorical assurance from Canadian Pacific that the ship was not for sale; in fact she was said to be operating at 82 per cent capacity throughout the summer of 1970.
at anchor at the Tail of the Bank off Greenock. "Will ye no come back again"? On 20th January 1971 Mr Robert Edwards, director of the Port of Liverpool, said that the end of passenger trade at Liverpool was 'inevitable'. Some £3 million was required to restore Princes Landing Stage to the standard required to operate large passenger ships. A month later the Riverside Railway Station, adjacent to the landing stage, was closed to all traffic. Unfortunately the EMPRESS OF CANADA was plagued with industrial unrest amongst her crew. Stewards persistently and totally unacceptably, demanded the use of passenger facilities to be made available to them. At 8.15pm on 22nd August 1971, when the EMPRESS OF CANADA was one day out of Liverpool, she suffered a blowback in one of her boilers with a resulting fire in the boiler room. There was a full scale alert with passengers being mustered at their lifeboat stations. However, the crew brought the fire under control within ten minutes. Without any advance warning, on 9th November 1971, Canadian Pacific announced that the EMPRESS OF CANADA would be withdrawn from service when she arrived back at Liverpool two weeks later on 23rd November. Canadian Pacific stated that 'economic circumstances make it impossible to achieve a viable passenger ship operation'. This brought to an end over two years of rumour and counter-rumour. The EMPRESS OF CANADA left Montreal at 8.am on 17th November 1971 with 300 passengers on board on her final voyage as a Canadian Pacific liner. In her ten-and-a-half years service the ship had completed 121 round voyages across the North Atlantic, and had sailed on 82 cruises. The Empress was back at Liverpool on 23rd November at the end of her last voyage and dock workers stood in silence as she moved slowly through the Gladstone River Entrance. "It was almost like the Cenotaph on Remembrance Day," said her master, Captain W.E. Williams, "I feel sorry for the people who might have travelled with us as passengers, but who now never will. They will never know what they missed." OF ENGLAND berthed together in the Gladstone Dock, Liverpool. With three long mournful blasts on her syren, the EMPRESS OF CANADA said 'goodbye' to the Mersey on 14th December 1971. With her lights blazing and her alleyways and decks deserted, Liverpool's last trans-Atlantic liner slipped her moorings at Gladstone Dock and got underway with a skeleton crew of less than 100. She was on her way to Tilbury, to be laid up until sold. Her master, Captain Richard Walgate, who had been with Canadian Pacific for forty-one years, said: "We all feel very sad at leaving Liverpool. We will be thinking about all the people who have sailed with us, and all the people we will be leaving behind. 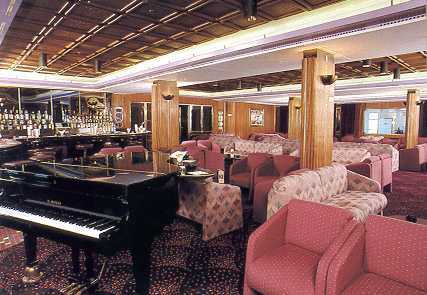 I have sailed on all the Empress liners. but I've always had a soft spot for this one." Captain Walgate supervised the final stages of the building of the ship on the Tyne, and sailed with her on her maiden voyage. There was only a small group of dockers, company officials and relatives of crewmen on the quayside to say 'goodbye'. As the EMPRESS OF CANADA sailed past Crosby, she sounded the Company signal, as had been done for years. Captain Walgate explained: "We always used to give this signal - two long, one short and one long blast on the ship's whistle [ 'Q' in the Morse Code ] - as we sailed past the Blundellsands home of the late Captain R.V. Burns, the general manager. It was a habit we all got used to on the Empress boats, and we keep it up because the people of the area expect it of us. Now the signal will be sounded for the last time." Canadian Pacific commented: "One of the difficulties is that, although the ship was built with cruising in mind, her design has since been overtaken by the specialised new liners now cruising in both the Mediterranean and the Caribbean." The EMPRESS OF CANADA was quickly sold to Ted Arison to become the pioneer ship in the Carnival Cruise lines fleet. 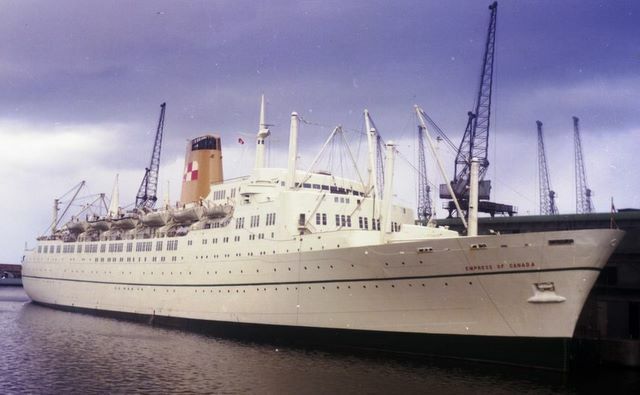 She was renamed MARDI GRAS on 14th February 1972. Her departure from Tilbury was delayed by the National Union of Seamen and Sam McCluskie, the NUS organiser, said: "We are picketing this ship in order to combat the growing menace of crews of convenience. Their low pay undermines the hard-won wages and conditions which the NUS has fought for." Tug crews and lock gate men at Tilbury 'blacked' the MARDI GRAS and she did not sail for Miami until 26th February. first ship in the Carnival Cruise Line's fleet. Carnival Cruises was initially in a very weak financial position and it was essential that the MARDI GRAS should earn money immediately. There was no time for a refit and on 11th March 1972 the MARDI GRAS left Miami on her first cruise for Ted Arison. At that time she was the largest liner using the port of Miami and was too deep-drafted, with the result that in fully laden condition the MARDI GRAS ran aground on departure. After twenty-four hours of fruitless effort to free her, the passengers were disembarked. She was eventually refloated and inspected and not found to be making water. The cruise continued. The Carnival cruise operation was constantly just one step away from bankruptcy in its early days. Nevertheless, the MARDI GRAS was rated as the 'Number One 7-Day Cruise Ship Sailing the Caribbean' by the travel trade in the United States. She was marketed as the 'Fun Ship'. 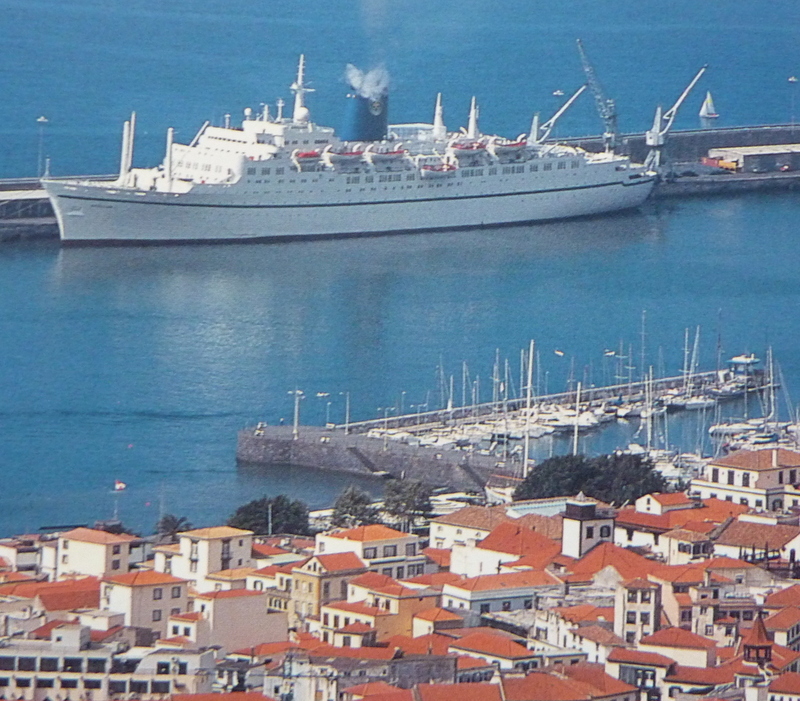 By 1975 Ted Arison urgently needed a running-mate for the MARDI GRAS, which he found in the QUEEN ANNA MARIA, the former EMPRESS OF BRITAIN, then laid up at Piraeus. In August 1979 the MARDI GRAS sailed on a cruise to Canada and arrived at Montreal on the 28th of the month. She received a fireboat welcome on her first visit to the port for eight years. Another Canadian cruise was operated in 1980, but as it turned out, this was the last time that the MARDI GRAS ever sailed in Canadian waters. 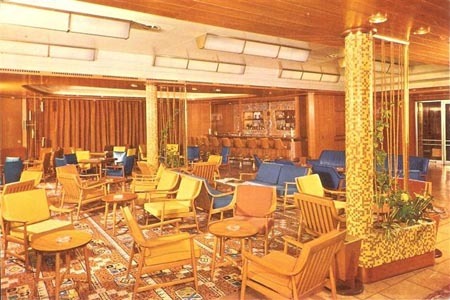 The attraction of brand-new cruise liners in the now rapidly expanding Carnival fleet could not dim the enduring popularity of the MARDI GRAS, and early in 1982 the ageing ship was given an extensive refurbishment. Even by 1989, after seventeen years with Carnival, the MARDI GRAS was still recognisable as the former EMPRESS OF CANADA. 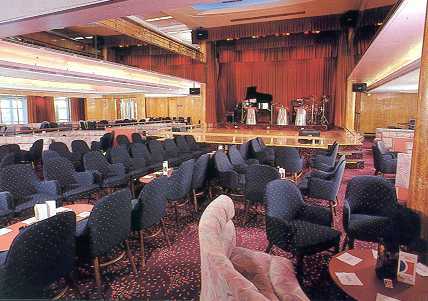 By 1992 Carnival was operating eighteen ships, and carried 1.1 million passengers that year. Towards the end of 1990 Carnival announced that it would transfer the MARDI GRAS (ex EMPRESS OF CANADA) to join the CARNIVALE (ex EMPRESS OF BRITAIN) operating out of Port Canaveral. The two former Empresses sailed on an identical schedule to the Bahamas, in convoy and never out of sight of each other. In 1993 the MARDI GRAS was chartered to Gold Star Cruises, based in Galveston, Texas, and renamed STAR OF TEXAS. She operated ten 'cruises to nowhere' each week consisting of four six-hour cruises, and six 'night-club' cruises. On 30th October 1993 the STAR OF TEXAS sailed on her first cruise for Gold Star. Gold Star Cruises rapidly found itself in financial difficulties, reportedly losing $4.5 million in just eleven months. On 9th November 1994 the STAR OF TEXAS was moved to Miami and renamed LUCKY STAR. She continued to operate short cruises, with one mid-week four-hour cruise costing just $19.95. The Gold Star operation was closed down on 30th December 1994 and the LUCKY STAR (ex EMPRESS OF CANADA) was laid up in the Bahamas for a short while before sailing to Piraeus, where she arrived on 10th May 1995. Her name was changed to APOLLON after her purchase by Royal Olympic. In 1997 a new British operator entered the UK cruise market, trading under the name of Direct Cruises. This was a subsidiary of the direct-sell package tour company Direct Holidays and was aimed primarily at the cruise market in the North of England and in Scotland. Direct Cruises secured a five-year charter of the APOLLON from Royal Olympic and, after a reputed $20 million repair and refurbishment at the Skaramanga shipyard, sailed from Piraeus for Liverpool. However the APOLLON was diverted to Avonmouth for engine repairs and it was not until 30th May 1998 that she reached Liverpool, some twenty six and a half years since she last left the port. 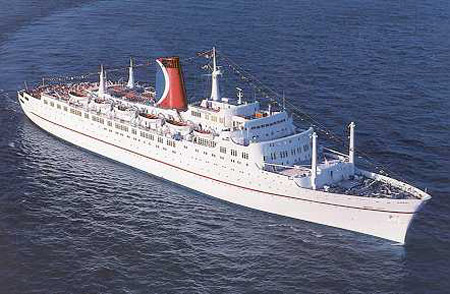 Apart from Liverpool, the APOLLON operated cruises from Greenock and Newcastle-upon-Tyne. 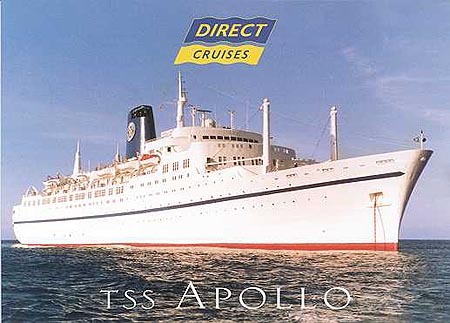 On 21st July 1999 Direct Holidays, the parent company of Direct Cruises, was sold to Airtours, and a few months later came the news that the APOLLON's charter was to be cancelled and the cruise programme for 2000 was to be abandoned. Poor bookings were cited as the reason for winding-up Direct Cruises. After a further period of lay-up, the APOLLON operated a programme of short cruises to the Greek Islands, commencing in May 2001. In July 2001 the APOLLON was chartered as an accommodation ship for delegates and press attending the G8 summit being held at Genoa, after which she returned to her cruise programme. 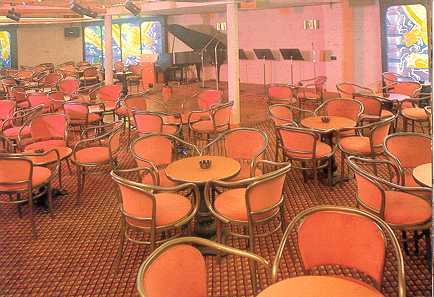 In February 2002, Royal Olympic claimed that the APOLLON was in need to complete refurbishment, and the old ship was once again laid up. 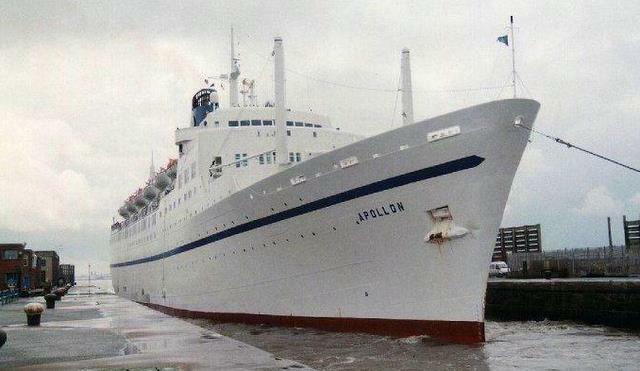 The APOLLON was sold for breaking up on 16th September 2003. Owners of redundant cruise ships were taking advantage of the higher prices which could be obtained for scrap metal. On 12th November the APOLLON left Piraeus on her final voyage to the breakers' yard at Alang, India, where she arrived on 4th December. Initially the old EMPRESS OF CANADA was anchored offshore. waiting to be hauled up the beach and reduced to a pile of scrap metal. <<>>.